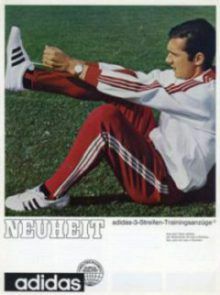 Franz Beckenbauer’s tracksuit was the first ever piece of apparel from adidas. Football has always been at the core of adidas’ efforts. Herbert Hainer became the new CEO of adidas-Salomon AG and, with him, the company’s focus went even more to innovation. ClimaCool (2002), adizero (2004) and the F50 football boot, launched just in time for the 2006 FIFA World Cup™ in Germany, became market hits – as did the new CEO. Herbert Hainer will lead the adidas Group from one record to the next and will become the longest-standing CEO of all DAX companies in 2011. Herbert Hainer is surrounded by a very international team of Executive Board members. It currently consists of Robin J. Stalker from New Zealand (Finance), Eric Liedtke (Global Brands) and Glenn Bennett (Global Operations), both from the USA, as well as Roland Auschel from Germany (Global Sales). As the new century started, the adidas Group reinvented the game again. In addition to its sport performance offering, adidas is the first in the industry to introduce a new lifestyle segment, focusing on sports-inspired streetwear. In the years to come, new partnerships with Yohji Yamamoto (2002) and Stella McCartney (2004) were born along with exciting labels such as Y-3 (2003) and Porsche Design Sport (2007). IMPOSSIBLE? JUST A BIG WORD. In 2011, the adidas Group acquired the outdoor specialist Five Ten, and TaylorMade first the golf company Ashworth in 2009 and then, three years later, the golf equipment company Adams Golf – making the Group even stronger for the road ahead. At the end of 2010, the adidas Group presented the most comprehensive strategic business plans in its history. “Route 2015” incorporates special targets for all brands, sales channels and Group functions globally. That same year, TaylorMade reached market leadership and became the biggest golf company worldwide. Speed: We will become the first true fast sports company: Fast in satisfying consumer needs, fast in internal decision-making. Cities: We have identified six key cities in which we want to grow share of mind, share of market and share of trend: New York, Los Angeles, Shanghai, Tokyo, London and Paris. Open source: We will be the first sports company that invites athletes, consumers and partners to be part of our brands.